Recent research has revealed that Bellows organized the composition by driving small pins into the canvas to create a highly mechanized geometric grid. This internal structure was influenced by the theories of the paint manufacturer Hardesty Maratta, who created a compositional system based on the shape of an equilateral triangle. Although Bellows’s elaborate organization creates compositional order and stability, it does not interfere with the overall energy and spontaneity of the scene. 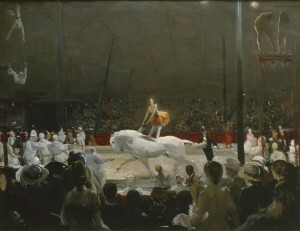 As in his earlier depictions of boxing and polo matches, The Circus is painted from the perspective of the crowd, providing the viewer with a momentary glimpse into the performance as it unfolds under the big top. Not all reviewers responded favorably to Bellows’s work, however. A critic for the New York American found it “impossible to take them [The Circus and Polo Crowd] seriously as a contribution to modern art, for even the technical problems for which they involve have been only touched upon; neither canvas has been completely organized.”  The criticism is ironic in light of the recent discovery of the painting’s highly mechanized geometric grid. Emma Bellows to Richard Bassett, October 29, 1948, Charles Morgan Papers, Box V, Folder 2, Special Collections Department, Amherst College Library, cited in Addison Gallery of American Art 65 Years: A Selective Catalogue (New York: Distributed Art Publishers, 1996), 323. Michael Quick, The Paintings of George Bellows, exh. cat. (Fort Worth: Amon Carter Museum of Western Art, 1992), 38-41. These rows were arranged to create a web of small equilateral triangles and various motifs within the work, such as the rider’s head, coincide with the pinholes in the canvas. See Addison Gallery of American Art 65 Years, 323. Furthermore, Bellows superimposed a large equilateral triangle over the composition, with its apex at the rider’s head and its base connecting the shoulders of the women in the foreground. See Quick, 40. Milton Brown, The Story of the Armory Show, 2nd ed. (New York: Abbeville Press, 1988), 246. Harriet Monroe, “Art Show Open to Freaks,” Chicago Daily Tribune, February 17, 1913, 5. “The American Section Still Reflects the Naturalistic Motive,” New York American, March 10, 1913, 7. These experiences laid the foundation for Bellows’s election to the Association of American Painters and Sculptors (A.A.P.S.) on January 2, 1912. He subsequently served on the committee tasked with organizing the Armory Show’s installation in the drill hall of the 69th Regiment. Bellows also exhibited fourteen of his own works at the Armory Show, including six oil paintings and eight drawings. Unlike many of his contemporaries, Bellows had never traveled to Europe, and so the Armory Show was his first large-scale introduction to European modernism. His response was mixed. He was ambivalent about Cubism, telling a reporter for the New York Sun: “They have arrived on the borderland of possible technical discoveries which may or may not be new and which may or may not be valuable.”  But he was inspired by many of the paintings he saw, particularly the vibrantly colored works of Pierre-Auguste Renoir, Georges Seurat, Vincent van Gogh, Henri Matisse, and André Derain. See Franklin Kelly et al., George Bellows, exh. cat. (Washington, D.C.: National Gallery of Art, 2012). In 1909, at the age of twenty-seven, Bellows was the youngest artist elected as an associate of the National Academy of Design. But he was active in independent movements. In 1910 he served on the hanging committee and displayed works at the first Exhibition of Independent Artists, organized by Henri and Sloan. In 1911 he joined the Pastellists, organized an Exhibition of Independent Artists in Columbus, and served on the painting committee of the MacDowell Club, an organization dedicated to exhibiting art without juries or awards. Walt Kuhn Papers, Series 2: Association of American Painters and Sculptors (A.A.P.S.) records, 1911-1914, box 3, folder 5, images 5-7, minutes of 1/2/12 meeting, Archives of American Art, Smithsonian Institution. Milton Brown, The Story of the Armory Show, 2nd ed. (New York: Abbeville Press, 1988), 83. George Bellows quoted in “Cubists Migrate; Thousands Mourn,” New York Sun, March 16, 1913, 15.